The worlds' best french toast, ever. 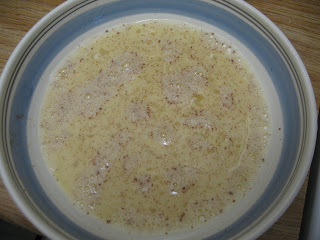 Add eggs, a hint of cinnamon, a dash of nutmeg, a big ol' pincha brown sugar and a splash of vanilla. Whisk. Dip some Texas toast or sliced french bread in that and cook in a frying pan on medium heat. 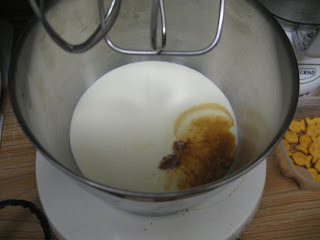 Meanwhile, whip up some heavy cream with a good, big splash of vanilla (almond extract is yummy, too, if you have it), a tiny little dash of cinnamon, and an equal mix of white sugar and powered sugar. Whip that up until it shows stiff peaks. 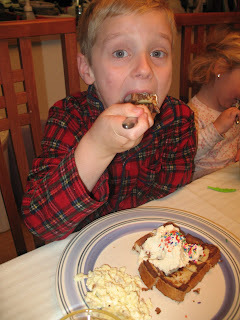 Plop the whipped cream on top of the french toast and put a bottle of sprinkles in the middle of the table. Healthy? Hell no. Delicious? Oh yeah. Pictures of kids mid-bite crack me right up. Ingredients: one copy of Babe, one DVD player, one TV, one very, very large box of animal crackers, one potty chair, one naked toddler. Place the movie in the DVD player, turn TV on. Place cookie box next to potty chair. Place toddler near the ingredients. Walk away. Go have a smoke, fold some laundry, whatever. Return ten minutes later to find the ingredients nicely combined. Warning: Subsequent attempts at this will, in all probability, not be as successful as the first try. Enjoy it while it lasts.